I suppose it is Monday. With the long holiday weekend, I wasn’t really thinking it was Monday and hadn’t thought about our meal plan for the week. And then I checked my email and saw all my fellow food blogger’s Meal Plans for this week. So I got on it. I started by looking in the refrigerator and freezer to see what needs to be eaten. We have some leftover quinoa, a couple of red bell peppers and half a bag of frozen stir fry vegetables. This past weekend we went to the Santa Fe Farmers Market and I picked up some chard to go along with my own small harvest of chard. I also harvested a bunch of basil this weekend and made some pesto. Quinoa, Black Bean and Sweet Potato Burgers – some variation of the many recipes I have found out there with the leftover quinoa, beans and sweet potato. Served with steamed artichokes and salad. Potato and Swiss Chard Curry – probably with some rice or salad on the side. Edamame and Vegetable Stir-Fry with San-J peanut sauce and brown rice. Moroccan Chickpea Salad – one of my favorite salads, especially for summer. 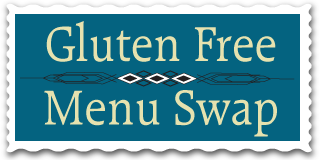 Omit the pita for gluten free. Creamy Pesto Rigatoni with Chunky Tomato Vinaigrette – it’s even better when you can find fresh, ripe tomatoes but I have been craving this, so I will make it with cherry tomatoes. 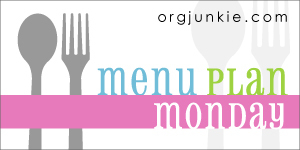 This meal plan is also linked up to Meal Plan Monday at OrgJunkie. love the idea of moroccan chickpea salad! love to have you host, just send me an ingredient. Oh my your menus always sound like EXACTLY what I want to be eating. I want to eat it all! Everything sounds better than the last – black bean, quinoa and sweet potato burgers? Wow! Potato and Swiss Chard Curry! Awesome! And so on…. All of the choices on your menu sound good to me. Some of my very favorite ingredients here. I think I’ll try a little quinoa and chickpea combo this week. I love that San-J Peanut sauce! YUM!! Your menu looks great! Yep, I always have to keep a bottle around. Even for just pouring over leftover rice – yummy!